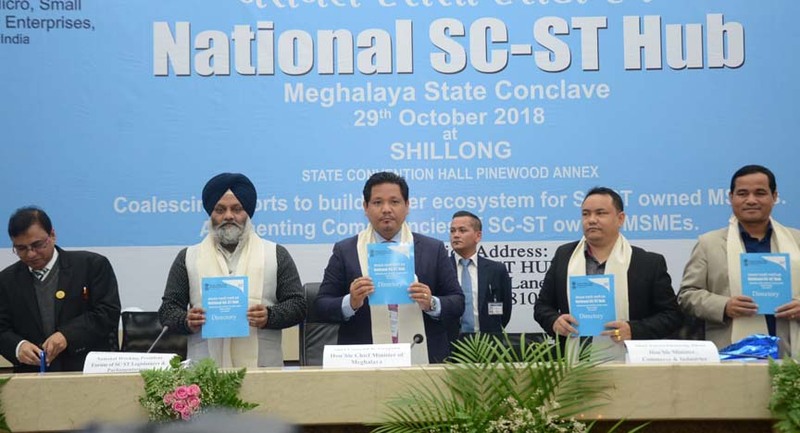 Meghalaya Chief Minister Conrad K Sangma on Monday attended the Meghalaya State Conclave on National SC-ST hub in Shillong. Chief Minister Conrad Sangma was accompanied by his cabinet colleague, Industries Minister Sniawbhalang Dhar and other dignitaries.The Meghalaya CM has informed that the Meghalaya State Conclave on National SC-ST hub is an initiative to promote welfare and entrepreneurship amongst the SC and ST community. The conclave was organised by the National Small Industries Corporation (NSIC), an implementing agency for the Central sector scheme, National SC-ST Hub (HSSH). The HSSH state conclave enlightened entrepreneurs about schemes under the Ministry of Micro, Small and Medium Enterprise and deliberate upon steps to be taken to fulfil the Public Procurement Policy mandate for SC/ST entrepreneurs. It also aimed at coalescing efforts taken by all stakeholders towards creating a supportive ecosystem for inclusive growth of SC/ST entrepreneurs. Attended the Meghalaya State Conclave on National SC-ST hub in Shillong with cabinet colleague Sniawbhalang Dhar and other dignitaries.